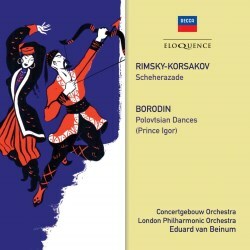 Stereo (Rimsky) and Mono (Borodin). Logically coupled, this disc conjoins a 1950 mono Decca with a 1956 stereo Philips: the former with van Beinum’s short-term directorship of the LPO, and the latter with his long-term relationship with his Concertgebouw Orchestra. Scheherazade was recorded in the Grote Zaal of the orchestra’s home. It’s a reading of architectural legerdemain and sumptuous orchestral sweep, very different to those near-contemporaneous recordings of such giants of colour as Beecham and Kletzki but possessing gigantic virtues of its own. These include the splendidly realistic and spatially sensitive recording, the superior playing of the orchestra’s leader Jan Damen, the consistently personable wind section, the glowering, muscular lower brass and the unhurried but narratively purposeful conducting. All these up to a long list of virtues that can be enjoyed in this vivid transfer – though you may well already have caught up with the reading in its incarnation as Great Conductors of The 20th Century, volume 26 (EMI Classics IMG Artists 5 75941 2). If not, one can appreciate the principal flautist’s seductive song, the corporate sonorities of the various orchestral choirs - not least those vividly stentorian brass players, and the bright-toned trumpet principal in The Story of the Kalendar Prince. There is a genuine sense of succulent romance in the perfectly pointed The Young Prince and the Young Princess, not least in the wind-over-percussion and in the stuttering trumpet calls and the balance between the harp and Damen’s riveting solo playing. This is not a performance as whipped-up as Beecham’s or as seductively colourised as Stokowski’s but it stands as an example of Beinum’s focused but never florid romanticism in action, and remains a reading both memorable and meaningful. He is on feisty but sensitive form in the P Dances where the London Philharmonic Chorus sings purposefully in English. It sounds well-balanced though loses a little in impact because of the mono recording and though Frederic Jackson was a fine choral trainer the women of the choir tend to sound a little matronly. That said, Beinum encourages strong rhythmic pointing in a genial performance. Even those seemingly sated with both works will enjoy these vintage performances.